Definition: Metabolic syndrome, sometimes known by other names, is a cluster of conditions — increased blood pressure, high blood sugar, excess body fat around the waist, and abnormal cholesterol or triglyceride levels — that occur together, increasing our risk of heart disease, stroke, and diabetes. The condition is also known by other names including Syndrome X, insulin resistance syndrome, and dysmetabolic syndrome. The number of people with metabolic syndrome increases with age, affecting more than 40% of people in their 60s and 70s. Although the first formal definition of metabolic syndrome entered medical textbooks not so long ago (1998), it is as widespread as pimples and the common cold. The syndrome runs in families and is more common among African-Americans, Hispanics, Asians, and Native Americans. The risks of developing metabolic syndrome increases as people’s age. If people have metabolic syndrome or any of its components, aggressive lifestyle changes can delay or even prevent the development of serious health problems. 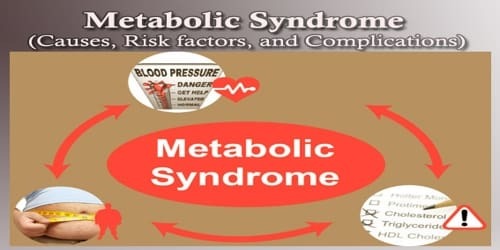 Causes and Risk factors of the Metabolic syndrome: The exact cause of metabolic syndrome is not known. Many features of the metabolic syndrome are associated with “insulin resistance.” Insulin resistance means that the body does not use insulin efficiently to lower glucose and triglyceride levels. Insulin resistance is a combination of genetic and lifestyle factors. Lifestyle factors include diet, activity and perhaps interrupted sleep patterns (such as sleep apnea). 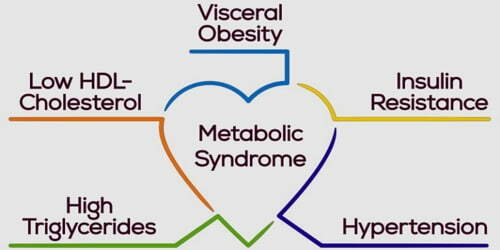 Metabolic syndrome is not a disease in itself. Instead, it’s a group of risk factors — high blood pressure, high blood sugar, unhealthy cholesterol levels, and abdominal fat. Other diseases. 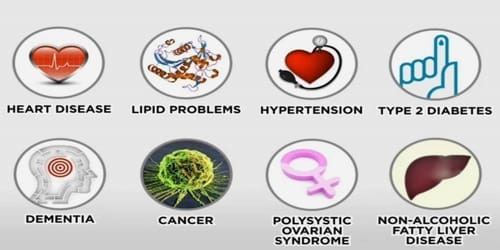 People’s risk of metabolic syndrome is higher if they have ever had cardiovascular disease, nonalcoholic fatty liver disease or polycystic ovary syndrome. Many components of metabolic syndrome are associated with a sedentary lifestyle, including increased adipose tissue (predominantly central); reduced HDL cholesterol; and a trend toward increased triglycerides, blood pressure, and glucose in the genetically susceptible. Compared with individuals who watched television or videos or used their computers for less than one hour daily, those who carried out these behaviors for greater than four hours daily have a twofold increased risk of metabolic syndrome. Complications of the Metabolic syndrome: Naturally, since the metabolic syndrome is a disorder of energy distribution and storage, fat accumulation explains for a significant proportion of cardiovascular risk. However, obesity without metabolic syndrome does not confer a significant cardiovascular risk, whereas metabolic syndrome without obesity is associated with a significant risk of diabetes and cardiovascular disease. Diabetes. If people don’t make lifestyle changes to control their excess weight, which can lead to insulin resistance, their glucose levels will continue to increase. People then might develop diabetes. Cardiovascular disease. High cholesterol and high blood pressure can contribute to the buildup of plaques in their arteries. These plaques can narrow and harden their arteries, which can lead to a heart attack or stroke. However, more recent evidence suggests that common triggers (for example, excessive sugar-intake in the environment of overabundant food) can contribute to the development of multiple metabolic abnormalities at the same time, supporting the commonality of the energy utilization and storage pathways in metabolic syndrome.